Check out our amazing raffle prize! One of the most evocative reminders of Victorian ingenuity at the British seaside is the much-loved cliff lift. This simple method of transporting people up and down the cliff side has been a feature of our coast, and a few inland towns, for over 150 years and has recently undergone a renaissance at places as varied as the National Coal Mining Museum, Legoland and the Centre for Alternative Technology. 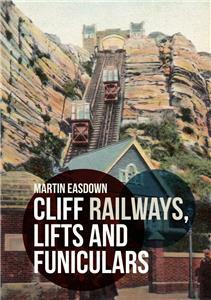 The cliff lift, otherwise termed the cliff railway or tramway, is also known as a funicular railway. The word ‘funicular’ is defined as ‘of rope or tension’, in other words a cable-hauled railway or tramway. The lifts were directly descended from cable-hauled railways, prevalent in mines and quarries, but also early passenger lines, where an engine or winding gear hauled loads up steep slopes. The term ‘cliff lift’ also generally encompasses the elevator-type lifts that were erected at some resorts. This book illustrates, mainly in colour, all the principal cliff lifts and railways that have been built in the British Isles, along with associated cable tramways, since their inception in the Victorian age. In addition to featuring all the surviving lifts, this book includes others which are long gone, and serves as a fine record of these charming and unique structures. Pay via Paypal, Payments can also be made via the phone. Items are either offered with free Postage or at a cost with a small surcharge for packing materials. more than one item from us. If you do pay without waiting, the postage difference cannot be refunded. All questions are answered as quickly and honestly as we can. We genuinely want you to enjoy your buying experience and we appreciate positive feedback once your purchases are happily received. We will reciprocate in due course. All items are aimed to be dispatched within 3-5 days of purchase and payment. If not, the buyer will be notified. Items are packaged as I would like to receive them myself. Returns are permitted on the very rare occurrence that items are damaged in transit. For this, we recommend that customers use the Ebay returns process. Any items returned that are not faulty or damaged will not be refunded the postage costs, and must be in a saleable condition, Including original packaging, to qualify for refund. The Vale of Rheidol Railway (Welsh: Rheilffordd Cwm Rheidol) is a 1ft 11 3/4 inches (603 mm) narrow gauge heritage railway that runs for 11 3?4 miles (18.9 km) between Aberystwyth and Devil's Bridge in the county of Ceredigion, Wales. Until privatisation, it was the sole steam-operated line on the nationalised British Rail network, steam traction having ceased in 1968 on all other parts of the system. Unlike some other preserved railways in the United Kingdom, the Vale of Rheidol Railway has never closed, with the exception of wartime and has operated a service for tourists through its life. The railway celebrated its centenary in 2002. The Railway is a charity, meaning the income it generates goes back into the railway, to aid in restoration and running of the steam locomotives. Buying through our online giftshop enables you to get the product you want but also donate to the railway and keep it alive.